In 2012, Tablet PC shipments were 10.31 million in China. What kind of situation is Surface Pro that started to sell in China last month? 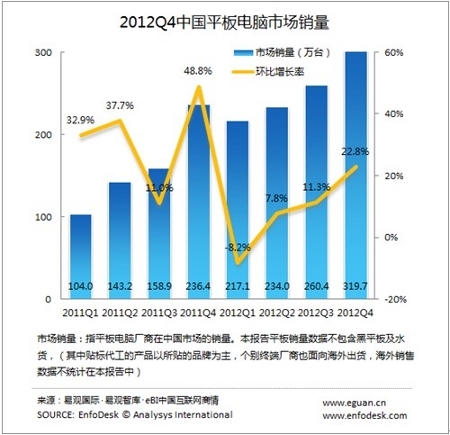 Eguan published the new report that is written about the sales status of Tablet PC in China as follows. According to this report, Tablet PC shipments were 3,197,000 units in the fourth quarter of 2012 in China, and it increased 35.2% compared to the last year. And their shipments were 10.31 million units in throughout the year for 2012, and it increased 60.5% compared to 2011. According to the report by IDC, Tablet PC shipments of worldwide were 52.5 million units in the fourth quarter of 2012, so it can be said that the share of shipments in China was about 6.1% of the worldwide. But Eguan said that 2013 will become the year of explosive growth for Tablet PC. Actually, many Android Tablet was already shipped to the market in China, and iPad is also welcomed as the status from many people. And Microsoft also started to sell "Surface Pro" in China from last month. But according to the sources, the selling status of Surface Pro is not so good. A staff of GOME said that its sales numbers are one-tenth of iPad. I think this main reason is the price of it. The price of Surface Pro is 6588 RMB, and it is much expensive than iPad(= 3688 RMB). We have to continue watching the market status of Tablet PC in China, and we also have to watch the strategy of Microsoft for Surface Pro in the future.